Lucky, the dog rescued by firefighters last week from the raging Los Angeles river, has a new forever home — with the woman who called 911 after she spotted him struggling to stay afloat. “I happened to see something out of the corner of my eye that looked like a piece of a log just bobbing along, but there was a rhythm to the movement that caught my attention, and I was able to look closer and confirm that it was, in fact, the head of a small dog,” Rachel Dably told CBS Los Angeles. She told the 911 dispatcher she wanted to adopt the dog. “He says, ‘Well, let’s get him rescued first,'” Dalby told KABC. When firefighters arrived, the dog had been swept nearly two miles down the river. Firefighter John Terrusa was lowered on a cable from a helicopter, swam to the terrified dog and scooped him up in his arms. But the rescue wasn’t a done deal yet — as the helicopter flew the two toward an embankment, they started spinning in circles, nearly hitting some tree branches. Lucky was treated for hypothermia as the North Central Los Angeles animal shelter tried to locate his owner. He was wearing a collar and leash, but no identification tags, and he wasn’t microchipped. 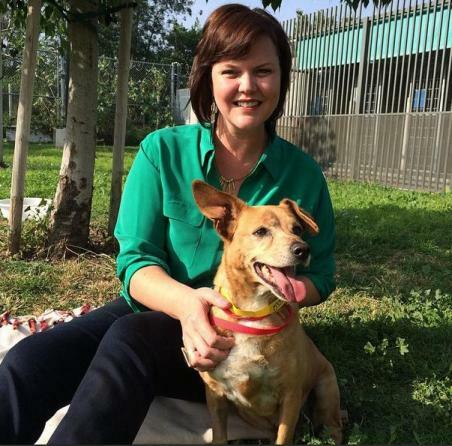 Dably told CBS Los Angeles she has been wanting to adopt a dog for a year, and visited Lucky in the shelter every day. “It was sort of a waiting game to see if there would be a claim of ownership,” she said. When no one claimed Lucky after the seven-day holding period, Dably became his new dog mom. “I’m excited — very excited,” she told CBS Los Angeles. She has set up the account luckytherescuedog on Instagram, where you can follow Lucky’s future adventures — which, it’s a sure bet, won’t include any swims in the L.A. River. Here’s a KNBC video of Lucky’s nail-biting rescue.